Definition - What does Acrosome mean? The acrosome is a cap that covers the head of the sperm. The acrosome facilitates the acrosomal reaction, which occurs when an egg cell and a sperm cell fuse together, leading to fertilization. Abnormal acrosomes can prevent fertilization and cause male-factor infertility. The primary role of the acrosome occurs during the earliest stages of fertilization, in a phase known as the acrosomal reaction. During natural conception, sperm travel through a woman’s reproductive system looking for an egg. 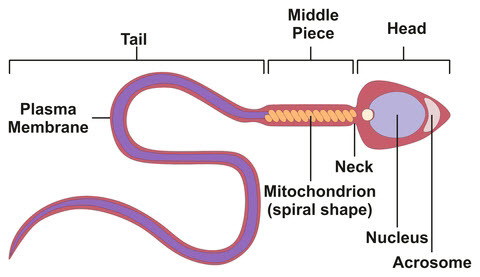 Once the egg has been located, the sperm attempt fertilization. During this stage, the egg is coated with a thick membrane layering called the zona pellucida. The acrosome releases a digestive enzyme called acrosine, which dissolves the zona pellucida, allowing the sperm to penetrate the egg’s membrane. The head of the sperm then fuses with the egg, and fertilization occurs. Abnormalities of the acrosome can prevent this process from occurring. Misshapen or dysfunctional acrosomes can impede the penetration, as can acrosomes that do not excrete the appropriate hormones or enzymes needed to break down the zona pellucida. This can be caused by genetic conditions, health disorders that impact sperm quality, or lifestyle choices that damage sperm quality, such as stress, smoking, drug use, or excessive alcohol intake. There are several tests that evaluate sperm. While a standard sperm analysis can visually test the sperm for the presence of a typical acrosome, it cannot test the acrosome’s ability to function normally when introduced to an egg. However, the acrosome reaction test uses a sperm sample to trigger the acrosome reaction sequence in a lab and evaluates the sperm’s performance. The results of this test can indicate the quality of the sperm’s acrosome. This indication of sperm potential can explain infertility in cases of visually healthy male sperm when no female infertility factors are present. Additionally, it can predict the level of intervention required during assisted reproductive treatments (ART).